Thank you for choosing Telerik RadScheduleView. RadScheduleView is a radically different scheduling component, going beyond the standard Microsoft Outlook-style control. RadScheduleView empowers the end user with unprecedented control over precision and flexibility when handling their appointments. This is achieved through features such as multi-level grouping, powerful zoom for smart navigation through a large number of appointments and blazing fast scrolling. Rich User Experience: The RadScheduleView control allows you to perform various operations in an interactive manner. You can drag tasks to new time slots or days, resize tasks to change their length, create all day appointments or modify your appointments through inline editing. Performance: The control provides blazing fast performance via the built-in UI virtualization feature that creates and re-uses containers only for the current viewport. Edit forms: You can easily create and edit appointments using the edit forms the control provides. The forms are displayed in built-in dialog windows. Read more about this in the End-User Capabilities article. Built-in and custom views: RadScheduleView comes with few predefined views - day, week, month and timeline - which can be customized. Read more about this in the ViewDefinintions section. Multi-level grouping: You can display multiple resources and group the appointments accordingly. Also, you can assign appointments to several resources and then group them as you need. Read more about this in the Grouping article. Orientation: The control allows you to change the view definitions orientation. Read more about this in the ViewDefinitions Configuration article. 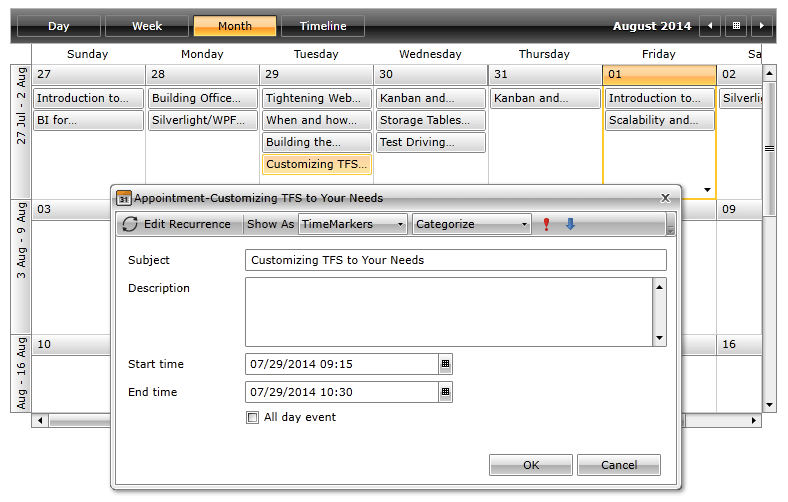 Dragging multiple appointments: The control supports drag/drop of multiple appointments at once. With the improved API you can fully customize the drag-drop and the resize operations. Read more about this in the Drag and Drop article. Zooming: The scheduleview supports zoom-in/out the appointments within the visible area of the schedule. This way, you can navigate through a big amount of appointments while keeping the fast performance of the control.